Many organizations are in the process of reviewing and evaluating how they organize and allocate capital to the full range of governance, risk management, compliance and internal control processes (GRC). This illustration shows you how to begin: by understanding where you are today, how to get organized, and how to integrate your approach and information. 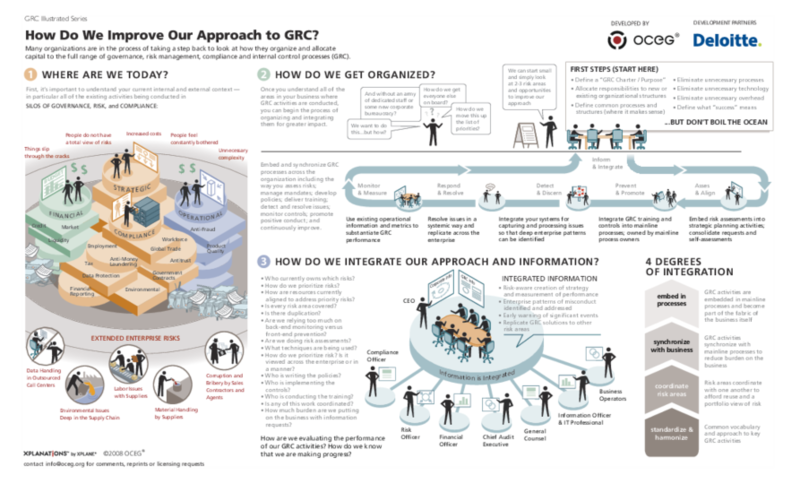 We have emailed instructions to access Illustration – How Do We Improve Our Approach To GRC to . Make sure the email arrives in your inbox: either add "support@oceg.org" as a safe sender to your email platform, or if you use Gmail, drag our email into your Primary tab.